It's like riding a bicycle! The wooden set of paper-tucked utensils that are hastily shoved into a greasy Chinese food takeout bag have much more of a sophisticated history. The first-known chopsticks were found in tombs in the Henan province, located in a central part of China. They were initially used for cooking -- made of bronze, the sticks could be submerged in pots of hot water. With time and a move toward smaller bites (a population boom in year 400 led to smaller portions and bite-sized eats) chopsticks evolved into an eating utensil. The use of knives began to fade from Asian cutlery as chopsticks popularized; the trend is often attributed to Confucius, an influential philosopher who was vegetarian. He supposedly believed that sharp utensils connoted violence. In one sense, chopsticks stood as a sign of peace. Nowadays, some dietitians recommend people eat with chopsticks when they're trying to lose or maintain weight; the simple tool makes it take more time to get food from plate to mouth, as opposed to the fork. Many of us have mastered the art of "shoving forkfuls" of food into our mouths at once. Chopsticks make this process take longer, and as a result make us more mindful of what and how much we're eating. 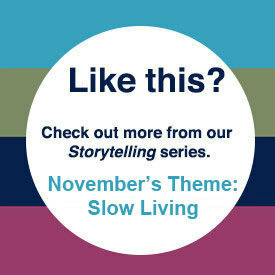 Slowing down gives the body time to register feelings of fullness before overeating. Whether you're using these simple sticks to eat more mindfully or because everyone else at the table is, and you're too embarrassed to ask for a fork, you should know the proper way to use them. It can be tricky at first -- you might feel like gripping a single chopstick with each hand and just stabbing your food until it sticks. But, with a little practice and a bit of patience, you'll be sure to get the hang of it. Follow these steps below. First things first, the pointy ends of the chopstick point downward -- think of your chopsticks as tweezer-shaped. Balance the bottom chopstick on the top your dominant hand's ring finger and underneath your thumb. This is the stationary chopstick. Hold the second chopstick with your thumb, index finger and middle finger. Your middle finger will act as the supporting base for the utensil, and the thumb and index finger will move to clamp the food against the stationary chopstick and bring it to your mouth. By the way, there are a couple of rules when it comes to chopstick etiquette. You should be gripping the chopsticks by the top third -- not close to the gripping points. Do not spear your food with the utensils. In the same vein, do not use one chopstick at a time. Both are required to function correctly (think tweezers, not skewers). When given a chopstick rest, use it. You should place the sticks neatly together, they should not cross.